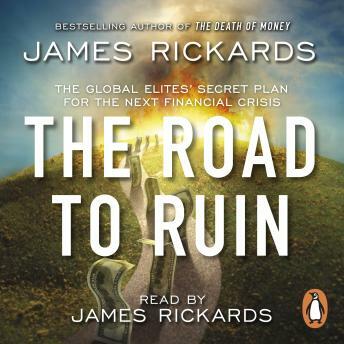 Penguin presents the unabridged, downloadable, audiobook edition of The Road to Ruin, written and read by James Rickards. The New York Times bestseller that reveals how investors can prepare for the next financial panic - and why it's coming sooner than you think. The global economy has made what seems like an incredible comeback after the financial crisis of 2008. Yet this comeback is artificial. Central banks have propped up markets by keeping interest rates low and the supply of money free-flowing. They won't bail us out again next time. And there will be a next time - soon. In The Road to Ruin, bestselling author James Rickards identifies how governments around the world are secretly preparing an alternative strategy for the next big crisis: a lockdown. Instead of printing money to reliquify markets and prop up assets, governments are preparing to close banks, shut down exchanges and order powerful asset managers not to sell. They're putting provisions in place that will allow them to do so legally. What's more, the global elite has already started making their own preparations, including hoarding cash and hard assets. When the next one comes, it will be the average investor who suffers most - unless he or she heeds Rickards' warning and prepares accordingly. James Rickards is the bestselling author of Currency Wars and The Death of Money. He is a portfolio manager at West Shore Group and an adviser on international economics and financial threats to the Department of Defence and the US intelligence community. He served as facilitator of the first-ever financial war games conducted by the Pentagon. James makes sense of global events and their relationship with the financial system. The fact that he also narrates adds a great touch to the experience. A must read for all those interested in finance, investment, history, and current affairs. Great insight into the next financial crisis and so much more! A must read in today's uncertain climate.